The path to productivity and success is paved by creating a solid daily sales schedule. Creating a productive daily sales schedule is one of the most common challenges that sales professionals face. A solid daily sales schedule can streamline productivity and improve the overall flow of your day. Keep these 3 key-aspects of an all-star daily sales schedule in mind when you are organizing your priorities for the day. All-Star sales reps perform all non-related sales activities between 6-8am in the morning and/or 6-8pm in the evening. These activities include planning, territory management, and improving product or service knowledge. Set some time in your daily sales schedule to take care of other tasks earlier or later in the day. Make sales your one and only focus during business hours. Elite sales professionals manage their daily sales schedule by prioritizing sales touch points by the Probability of Making the Sale. Pay attention to how your prospect prefers to be contacted. Younger prospects may prefer email or social media, while older prospects prefer a phone call. Sales touch points also include knowing your prospects availability and schedule. Seasoned sales professionals follow up with at least 3 older sales leads every single day. Ensure that your daily sales schedule involves reaching out to your leads in a timely and professional manner. Have your notes ready and be prepared to talk about any relevant issues or concerns. Show your prospects value through professional consulting and offer specific advice to improve their business. 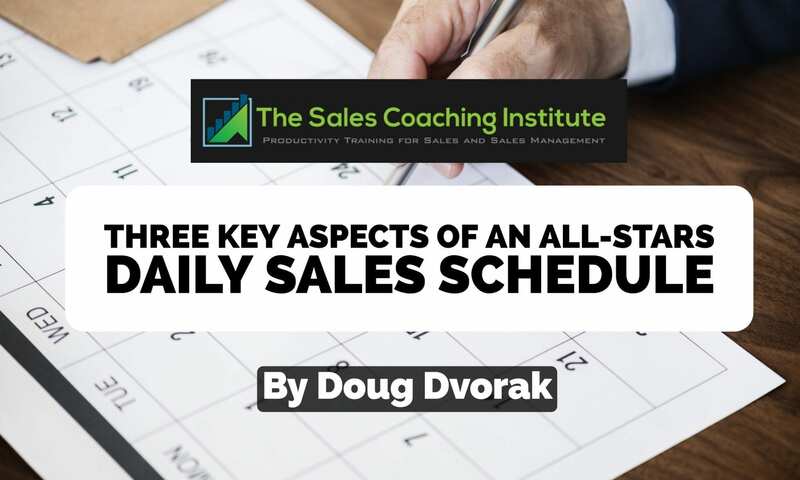 If you would like more information on creating an all-star daily sales schedule sign up for our the Sales Coaching Institute newsletter to learn more!